He has iFever | Laughing is required. Thanks to my parents, my 7-year-old has had an iPod touch for a while now. He has been trying really hard to figure out how to send and receive messages on his iPod. He has poked that green message app and asked me how it works at least five times. Me, not knowing any better, said he needed to have an email account to send messages, so he talked about creating his own email account. In fact, he was debating which email provider he wanted to go with this past Saturday night. I did not know about iMessaging until Friday for two reasons: 1) I just joined the iWorld and 2) one of my coworkers shared some iTips. She explained that iPhones, iPods and iPads can send messages to each other for free. So, when my 7-year-old came to me last night about that green message app, I knew what to do this time. 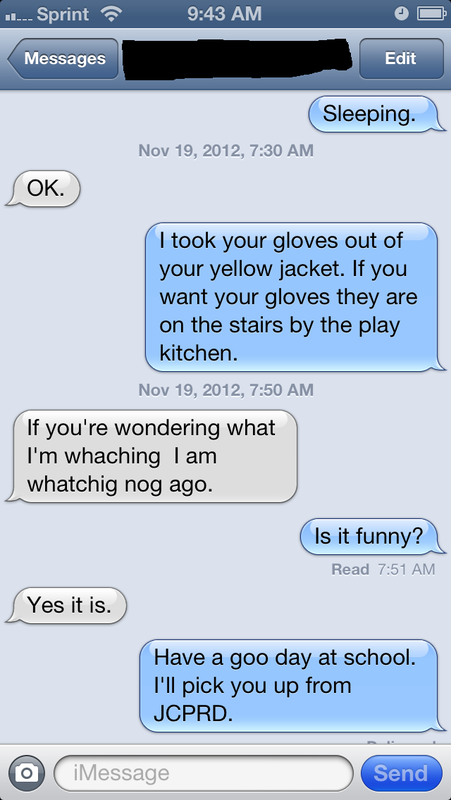 A delayed bedtime and several “Is it set up yet?” questions later, he and I were iMessaging. He would type out a message, hit send, hear my phone beep and start giggling like crazy. After I hit the send button I could hear my son reading my message out loud to the hubs and laughing. He ran upstairs to find me. “You said have a ‘goo’ day! You forgot the ‘d’ on good. Goo day!” he said and started cracking up. Let the messaging bloopers begin.